The emergence of climate change and endocrine disruptor chemicals (EDCs) as crucial societal challenges became priority topics in the last decades. Still, there is a flagrant knowledge gap in relating those 2 kinds of priority concerns. However, for global climate change, predicting the response of ecosystems and resources is problematic and is at a very early stage. Besides climate change, over the last 2 decades, considerable concern has been given to the environmental health risks posed by endocrine disruptor chemicals (EDCs) that possibly upset animal hormonal systems. Also, despite EDCs have been widely studied worldwide, little attention has been paid to some specific steroid hormones, such as progestins and the risks they pose to aquatic organisms are largely unknown. 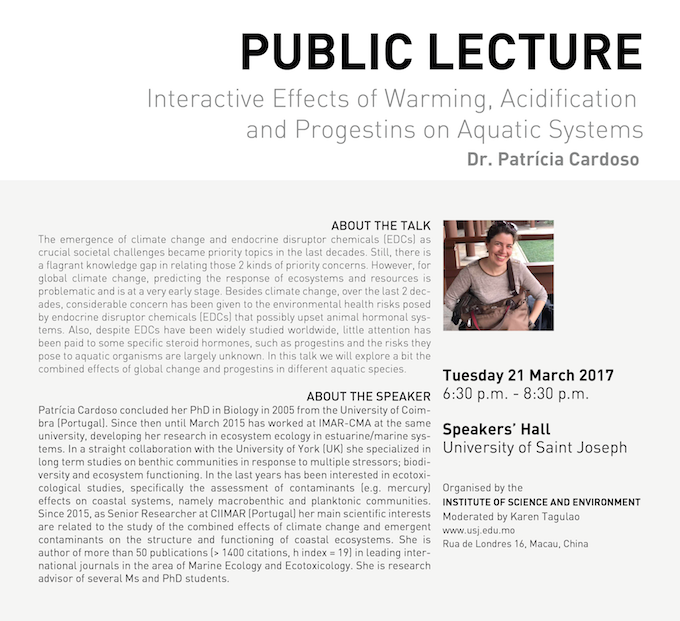 In this talk we will explore a bit the combined effects of global change and progestins in different aquatic species. Patrícia Cardoso concluded her PhD in Biology in 2005 from the University of Coimbra (Portugal). Since then until March 2015 has worked at IMAR-CMA at the same university, developing her research in ecosystem ecology in estuarine/marine systems. In a straight collaboration with the University of York (UK) she specialized in long term studies on benthic communities in response to multiple stressors; biodiversity and ecosystem functioning. In the last years has been interested in ecotoxicological studies, specifically the assessment of contaminants (e.g. mercury) effects on coastal systems, namely macrobenthic and planktonic communities. Since 2015, as Senior Researcher at CIIMAR (Portugal) her main scientific interests are related to the study of the combined effects of climate change and emergent contaminants on the structure and functioning of coastal ecosystems. She is author of more than 50 publications (> 1400 citations, h index = 19) in leading international journals in the area of Marine Ecology and Ecotoxicology. She is research advisor of several Ms and PhD students.